There is so much fun about camping: nature, fresh air, the beautiful sights. It is kind of magical, to be honest. 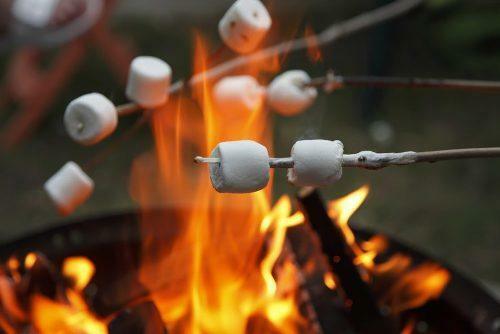 But one of the best ways to immerse yourself in the experience is to try your hand at cooking with campfire. 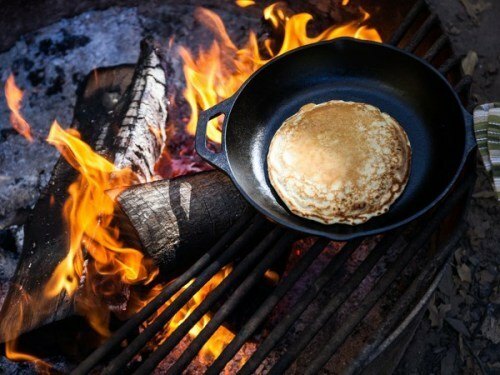 Even though nowadays there are campfire stoves and the like available, you’ll find that food prepared on a campfire has a unique appeal. Some people are scared to try it because working with an open fire can be daunting. And while we definitely understand that, we still think that it’s not as overwhelming as it might seem. 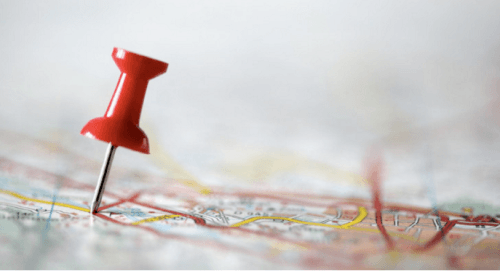 In this article we will go over the important points and then you can gauge for yourself how simple it really is. Ready? Okay! Let’s Get That Fire Started! Before we actually get started with cooking, it’s important to make sure we’ve made all the necessary preparations. This includes meal planning, equipment, etc. It’s essentially the first stage and requires a great deal of attention. We stress the importance of proper preparation because it helps you save time. 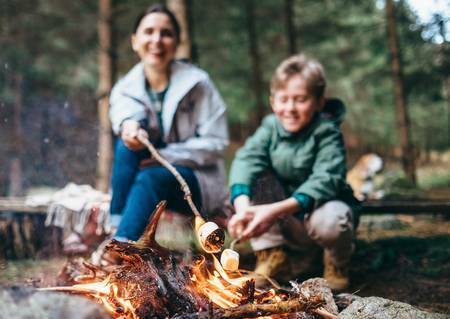 If you have everything you need and have everything figured out, then at the campfire you can focus entirely on the cooking itself without having to waste any time. So, first things first. You need to make sure you have a menu planned. How simple or fancy it is depends on you, but you need to have a solid idea in mind. 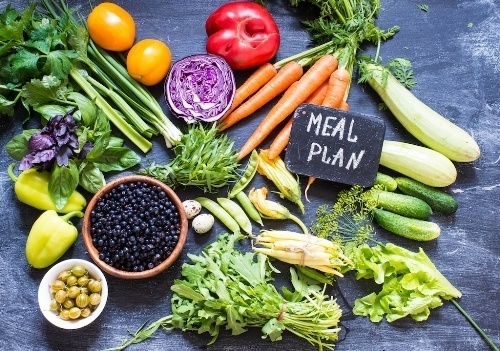 After you’ve figured out what sort of food you want to eat, you can make a checklist and go through everything and make sure you have everything you need. Now you have a smaller chance of running into a food shortage at camp! Building on the point about menus, this is also an extremely helpful step in saving time. 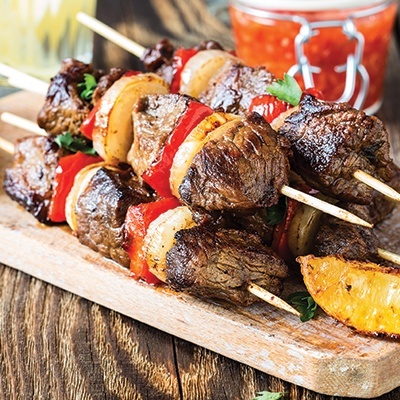 If you want to prepare certain kinds of meat or vegetables, then you can marinate them beforehand so the food is ready for cooking by the time you’re itching for a meal at camp. It’s also more convenient to take care of chopping vegetables and marinating meat, etc. at home as compared to the campsite. 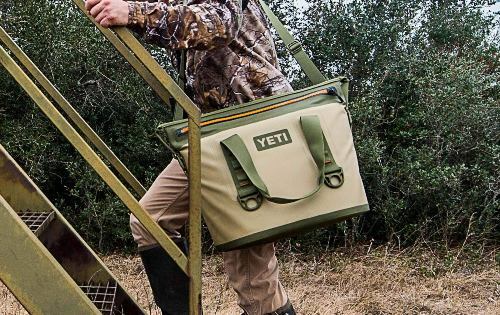 The next point to consider is coolers. This might sound like a very obvious suggestion but sometimes people forget the simplest things, so let’s cover our bases and talk about them too. Coolers are essential for camping in general but for campfire cooking you absolutely need them for storage. You might not need them if you just plan on taking along a few drinks, but for cooking? You absolutely need them. Your fruits, vegetables, and meat are not going to be too happy if you don’t find some kind of cold storage for them. Generally speaking, we think it’s best to have multiple small coolers since some things can survive if the cooler is opened several times (sauces like ketchup and mustard) but a lot of things require a little more refrigeration than that. So having separate coolers for meat and sauces is our suggestion. Though, of course this isn’t economically feasible for everyone so it’s understandable if you’d prefer using a single cooler instead. Now that we’ve established what sort of preparation we need for the actual cooking, let’s talk about the actual fire, the star of the show! While it’s not entirely necessary, I think you should also have a decent amount of water nearby just in case the fire proves to be unruly. Before you even think about starting your fire, you need to scan the site you’ll be using. It’s best to go over the area as thoroughly as possible to make sure there are no bushes, debris or tree branches around. Once you’re certain that the area is clear for the fire you need to start making a U-shaped perimeter to contain the fire. You could use either rocks or green logs for this, though try to keep in mind that the logs will have to be wet down occasionally if you choose to use them. Another point worth noting is that the back of the fire pit should face the wind if you’re cooking on a particularly windy day. The last step of fire preparation is to create a “chimney rock”. In simple terms, this is a large rock placed at the rear of the fire pit to divert all the smoke upwards. No one wants to be choking on smoke while they cook, after all! Next, you need to get started on the kindling. To start you can use tinder or crumped paper to fill the area. With that covered, next you have to lay the kindling. 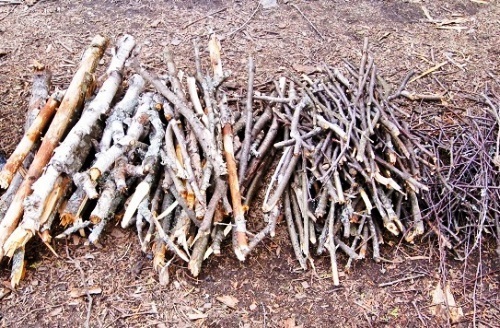 It’s fairly simple: all you have to do is place the kindling in alternating directions as you layer them. Depending on what’s most convenient for you, either thin splits of wood or small dead branches can both get the job done. Note that you need to stack your kindling in such a way that the entire fire area is completely covered; there shouldn’t be any spaces whatsoever. 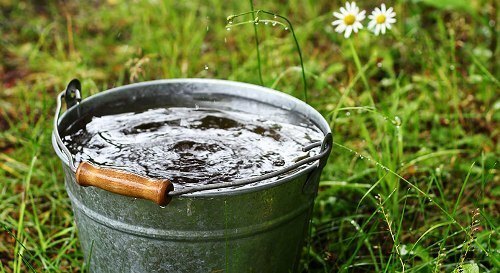 Again, it’s our personal suggestion to have a bucket of water nearby for this part to guarantee your safety. So once you have your water, set the paper alight and start your fire! Starting your fire isn’t the endgame here, so don’t start celebrating just yet. Now that you have a fire going, you need to make sure you can maintain it for as long as necessary. Coals are your next priority! So, now that your kindling has been lit you can start adding firewood into the mix. Word for the wise, try to make sure the firewood is as symmetrical as possible, it’s very important for the fire bed to be covered equally. Hardwood or hardwood branches are both equally as effective for this part. Always go for dry woods as they usually burn faster and produce less smoke. You will see white coals once the fire settles down, at this stage you can opt to move around the coals a little bit. It’s really up to you how to push them, though the easiest method would be pushing the coals to higher levels on the back and lower levels in the front. This creates a simple scale for the cooking. Food that needs more heat for cooking can be accommodated at the same time as food that needs lower heat. This is followed by placing the grill on the rocks/logs. When you begin cooking your meal, you have to place the food directly onto the grill or in your preferred choice of cookware. If you’re using the grill method, try to keep a small spray bottle handy for dealing with any rogue flames. If you don’t have a spray bottle, a squirt gun is also a good way to deal with the same problem. First and foremost, check your inventory! While being prepared has already been discussed, the inventory aspect hasn’t. 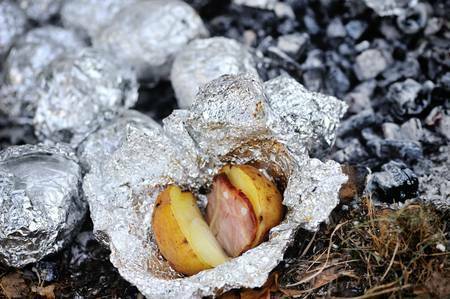 When cooking with campfire, you need to make a checklist and make sure you have everything you’ll need. While this definitely includes food, it also includes everything you’ll need to actually start the fire. So you need to check and confirm that you have fire resistant gloves, a shovel for scattering debris, and firewood. Firewood is the most important part and shouldn’t be left to chance. While there are several campgrounds that provide it for you, I think it’s better to carry your own from the get go. Let the fire rest! Now a lot of people might think that the fire is ready for cooking as soon as you see the flames. This is definitely a rookie mistake, because all you’ll be able to make is burnt food. When it’s ready for cooking, your fire will look like a few burning logs and a lot of hot coals. You need to take the weather into account, but usually the fire needs 30-45 minutes before it can be used to prepare food. Slowly introduce more wood! It can definitely be tempting to add all the wood in one go for a fantastic blaze, but honestly this is extremely impractical. Larger fires get extinguished much faster and as a result you’re stuck with coals that are too hot to use and no direct fire. And on top of all this, you won’t be able to maintain your fire because you’ll be out of wood. If you’ve ever made this faux pas then you’ve probably experienced the fire going out while you’re still cooking. Don’t cook directly on the fire! We’ve all seen the picture numerous times in cartoons, where a bunch of characters sit around a campfire and cook directly on the flame. I’m here to tell you, it doesn’t quite work like that. I was shocked too when I first found out. In reality, all this does is burn your food because the fire is too harsh. What you should do is distribute the coals at different levels and then use a grill on top of the coals. Trust me, this one’s a life saver! Technically, starting campfires for any reason have the potential to do a fair bit of harm to the environment if left unchecked. But, even then campfires aren’t all bad! 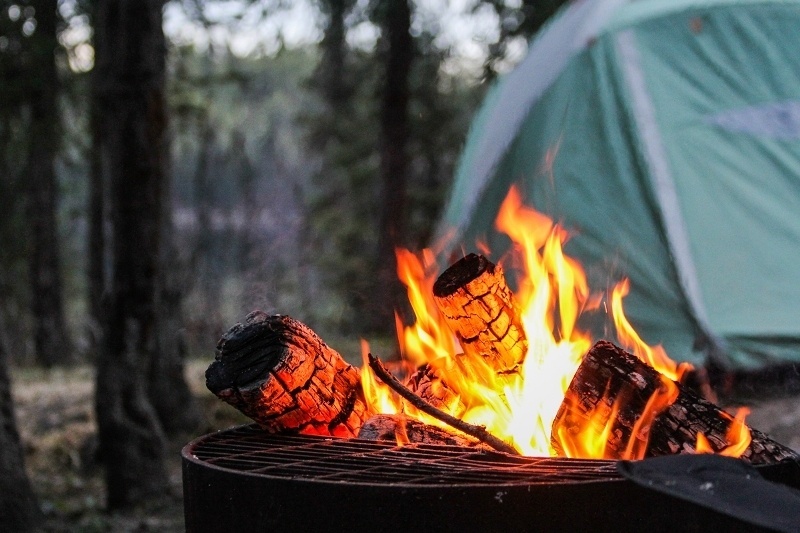 As long as you make sure to follow the rules of your campground and respectfully go about your business, you can easily take advantage of some very nice benefits when cooking with campfire. 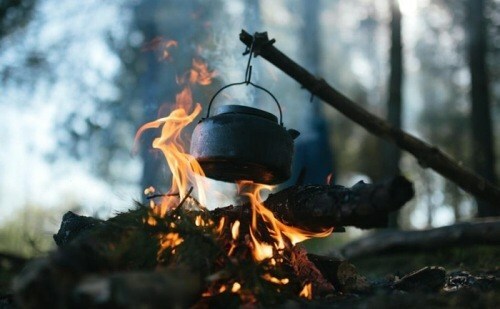 The most obvious among these is of course the fact that camping is much more engaging when you cook with a campfire. People go camping to immerse themselves in nature and one of the best ways to do that is to get nature’s help for making your food. Plus, (literally) eating the fruits of your labour always leaves you with a sense of accomplishment. Second, when you cook with a campfire, you generally need less equipment than otherwise. So this is a great benefit for those that either can’t afford fancy cookware or those that have limited storage space. 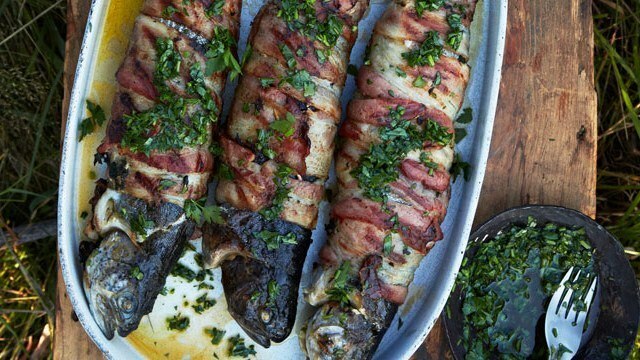 All this talk of campfires and food is sure to get you wondering what would be best for your menu. Try not to get too worried about that because I got some recipes together to help you figure it out! Enjoy! 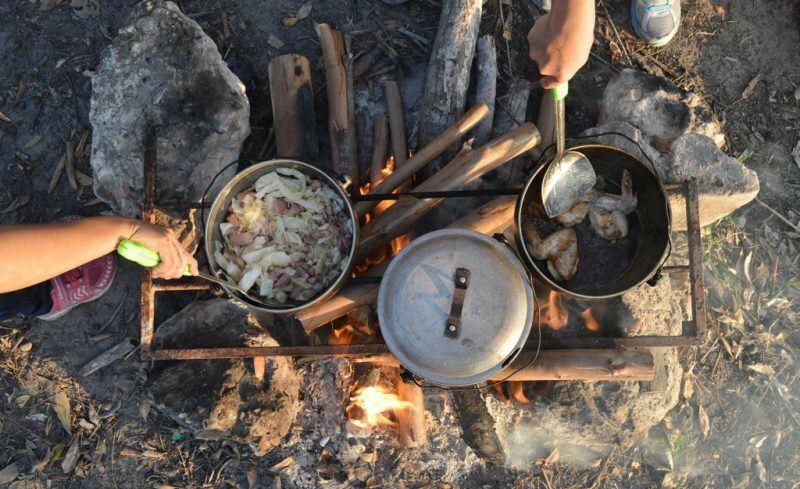 Cooking with campfire is indeed fun and it must not be missed especially if it is an outing with a group of friends and families. Well preparation is needed in order to enjoy your cooking experience to the fullest while minimizing the messes. Thinking about how hard it is to setup a campfire and want to skip all the messes? Consider getting a portable grill. The device is convenient and usually runs on disposable propane cylinder while giving you a good meal at the same time.